In pretty much every actor’s filmography there’s usually at least one movie that hardly anyone ever sees, and slips past audiences like a whisper in the night. These movies are often ones that have been made quickly and cheaply, with mid-range stars either on their way up the Ladder of Stardom, or heading back down it. Sometimes they’re movies that have been made for an international market, with said mid-range stars heading up a European or African or Far Eastern cast, and sometimes only appearing for maybe a third of the movie’s running time. And sometimes, those mid-range stars have taken part as a favour to the director, or a producer, or someone else attached to the project. In essence, they’re jobbing gigs, a somewhat easy payday for the actor(s) concerned, and one that they’ll look back on only if pressed. It’s hard to determine if there really is a market for these kinds of movies. There are enough of them out there to prove that people are willing to invest in them, but often it’s hard to determine who is the target audience (aside from any fans of the stars that appear in them). 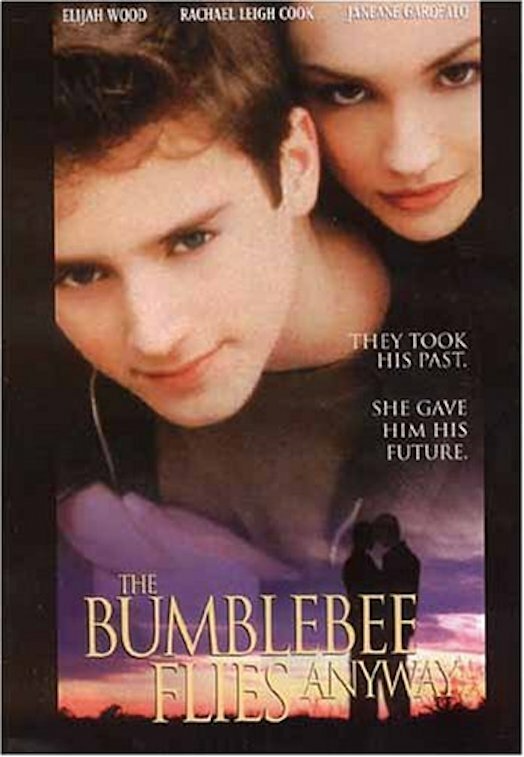 And one such movie is The Bumblebee Flies Anyway, a feature that appeared at the Deauville Film Festival in September 1999, opened briefly in the US in January 2000, and hasn’t been seen in cinemas anywhere in the world since. If you’re one of the few people who saw it way back then, then you probably already know the reason why it had such a limited exposure. And that’s because it’s bad, so very, very bad. The story itself is puzzlingly obscure, with Elijah Wood’s car crash amnesiac, Barney Snow (no, really) taking part in a medical experiment designed to help him deal with his involvement in the crash and move on with his life. But he’s receiving his treatment in a medical facility for terminal cancer patients, all of whom are teenagers or younger (well, all actually means three). Barney is kept on medication (or “the merchandise” as he keeps calling it for no apparent reason), and is sedated every now and again and taken to a basement room where he undergoes some form of regressive hypnotherapy (which he doesn’t know about). Meanwhile he makes friends with bone cancer sufferer Mazzo (Perrino), kidney cancer victim Billy (Gore II), and undisclosed cancer patient Allie (Force). The movie tries to present their respective illnesses with as much poignancy as it can, particularly Mazzo’s, but does so in a way that makes Billy and Allie look like poster boys for cancer remission. As Mazzo gets worse and worse, he receives a visit from his twin sister, Cassie (Cook). Concerned about her brother she naturally turns to Barney for comfort and they begin a tentative romance (well, what else are they likely to do?). But Barney has his own problems. He has a memory of the car crash and a woman stepping out in front of his car that just won’t go away. He thinks the woman is his mother but he can’t remember her name. When he does he persuades Billy to help him locate her address, and gets Cassie to drive him there. The visit doesn’t go as planned, and subsequent treatments by Barney’s doctors, Harriman (Garofalo) and Croft (Rees), cause further memories to surface, and in them, Barney learns about the basement room and the inherent contradiction that exists at the heart of his treatment. Soon he has a difficult choice to make, one that will have far-reaching consequences whichever way he decides. But before then he makes another difficult choice, and this time it’s one with the potential to affect everyone around him. Everything about Barney’s predicament and the so-called medical facility that he resides at is so ridiculous it’s hard to take any of it seriously. Garofalo’s caring doctor advises Barney not to get attached to Mazzo et al, but he finds himself drawn into their worlds almost against his will, and not caring about them doesn’t become an option. None of it however, is compelling or dramatic enough to make the unsuspecting viewer care about any of them, and the cast find themselves endlessly bogged down in scenes that should be affecting but which are so flatly directed by Duffy that they inspire ennui instead. Indeed, the combination of Duffy’s pedestrian direction and Sarja’s lumbering screenplay leaves Wood and his co-stars struggling to inject any purpose into their performances, and any meaningful exchanges between the characters are undermined before they’ve even begun. It all leads to a rooftop “showdown” that is laughable instead of sincere, and insufferably trite instead of emotionally haunting. Not the best outcome for a movie that already has enough strikes against it to warrant an enquiry into just how it received a showing at Deauville in the first place.